Australian Superyachts provides the opportunity for you to become an owner of a brand new Majesty 100 superyacht via Australia’s only superyacht syndication service. We call this service ‘ASY Syndicates’. ASY Syndicates provides a simple system that enables a maximum of up to ten co-owners to purchase and enjoy a brand new, luxury Majesty 100 superyacht thanks to ASY’s exclusive Australian distribution arrangements with Gulf Craft. ASY Syndicates limits the number of co-owners per yacht (between two and ten) to ensure that each owner is able to make use of the yacht during the peak season. Co-owners can choose 10%, 20% or 50% ownership. ASY Syndicates manages the superyacht on an all-inclusive basis – everything is handled by the comprehensive ASY Syndicates’ concierge service. ASY employs and manages the crew on your behalf to ensure that all co-owners enjoy only the very best service. The annual maintenance and management costs are divided between the owners on a pro-rata basis – ensuring a vastly reduced yearly expense for owning such a spectacular superyacht. 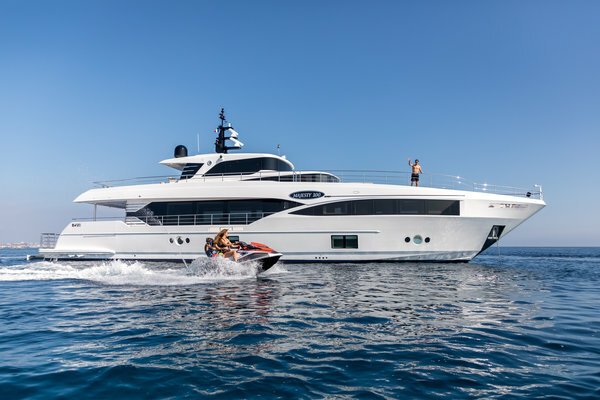 Every ASY Syndicates’ Superyacht is equipped with a tender and a range of equipment and inflatables for water sports such as water skiing, paddle boarding, Seabob, snorkelling and diving. The ASY Syndication structure provides the ability to purchase and enjoy a spectacular asset, whilst at the same time creating the opportunity to gear the investment for the proportion of time when the asset is not being used. Our Syndication offering provides you with access to a superyacht experience for the same outlay as owning a pleasure craft! Contact us now to for more information!